Above is a model of the expected Zcm with 11 turns of RG58C/U coax and an equivalent shunt capacitance of 4.6pF. Hams wax on about the capacity of RG58 to withstand the voltages experienced with severely mismatched antenna, and some online experts glean voltage withstand figures of 400-600V. Lets test a sample of the coax used. Above, a sample of the coax withstands 6.17kV RMS, 8.7kVpk. 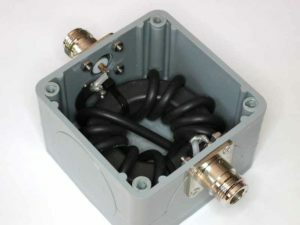 This is more than the coax connectors and pigtails of the connections will withstand, the coax is quite up to this task. The pic above shows the basic winding of 11 turns in Reisert cross over configuration so that the input and output are conveniently on opposite sides of the box. The choke could be employed as-is in a feed line, or it could be encapsulated in a non-conductive enclosure. I recommend against using a conductive enclosure. 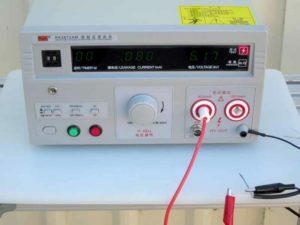 Above, the choke is house in a non-conductive box to avoid compromising Zcm with unnecessary shunt capacitance to ground. 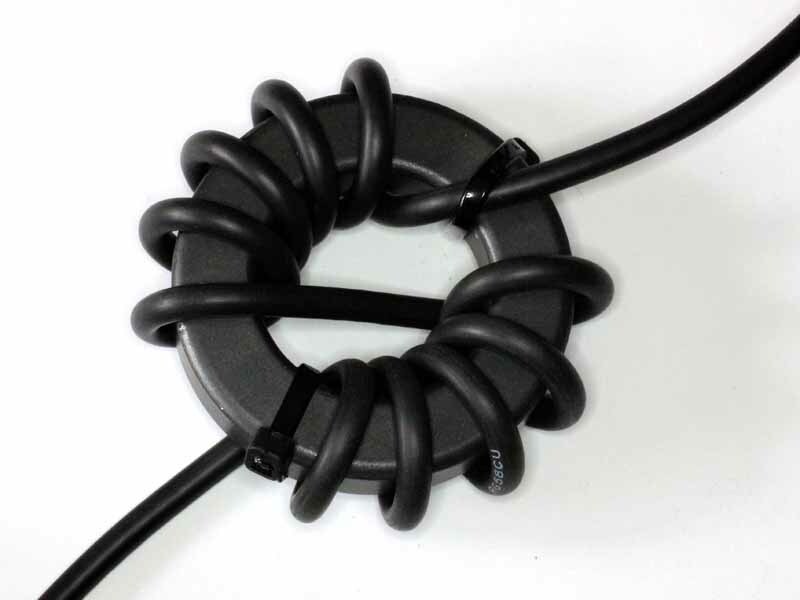 The prototype uses N connectors because they are good electrically, but also that they are waterproof when mated (assuming connector bodies that seal to the cable jacket). 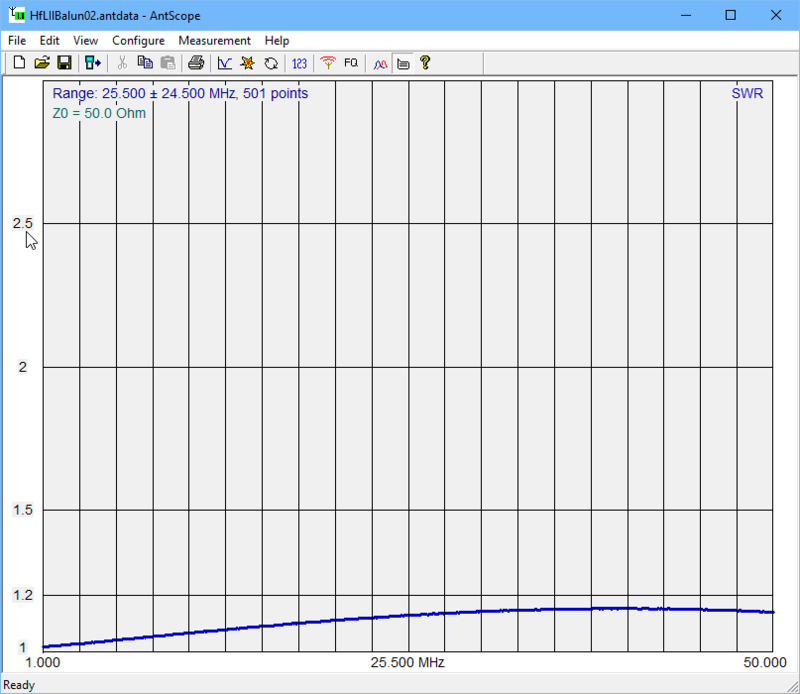 Above is a plot of the measured Zcm. 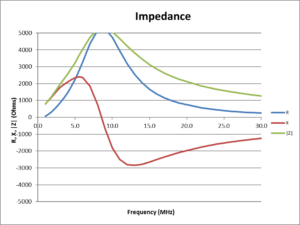 Self Resonant Frequency is about 8.5MHz. The measurement is made with a Rigexpert AA-600 and SOL calibrated fixture, and plot is produced with a back level version of Antscope (the latest version’s ‘enhancements’ prevent making this plot). 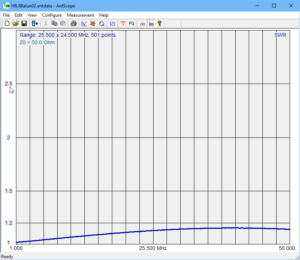 |Z|>1500Ω over all of HF and exceeds 2000Ω from 2.4 to 24MHz. 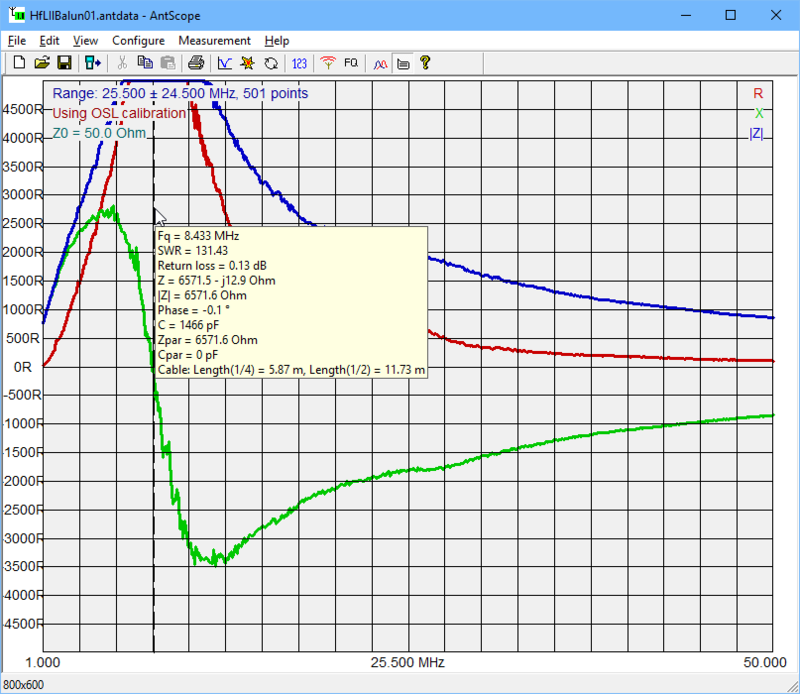 Above is a plot of the Insertion VSWR. Not brilliant, but good enough for this task. 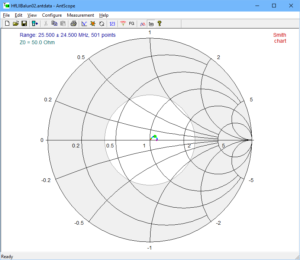 Lets look at a Smith chart plot of a matched load. 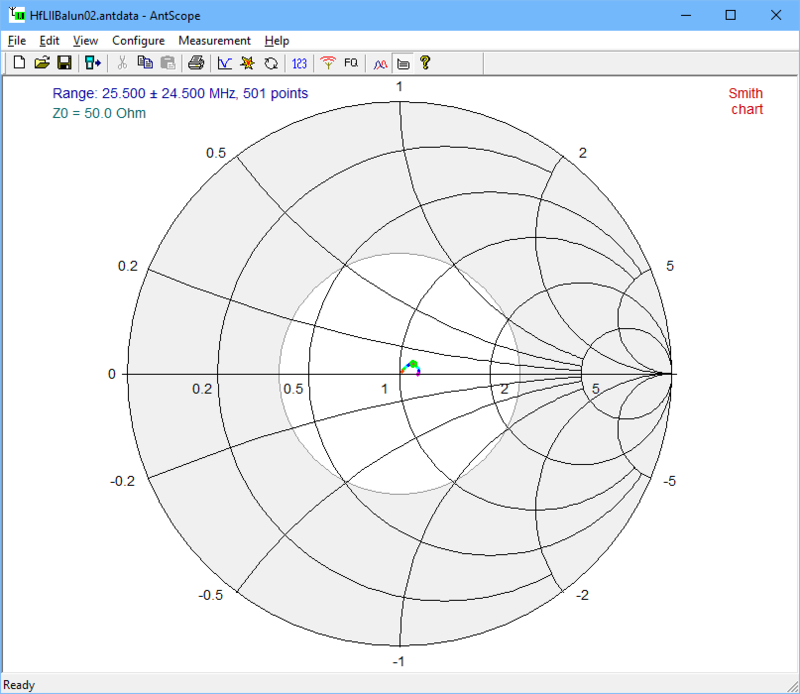 Above, the Smith chart plot shows a spiral centred on R=54Ω hinting that the Zo of the coax might be closer to 54Ω than 50Ω, a consequence possibly of the very tight radius bends around the core (about half of the specified min bend radius). It might also be an artifact of the budget coax, but other uses of it have tested ok. I would expect foam dielectric coax to be even less tolerant of the tight bends and hence my reason to recommend against it. Balun sellers tend not to publish this information, but to their credit, Balun Designs do. 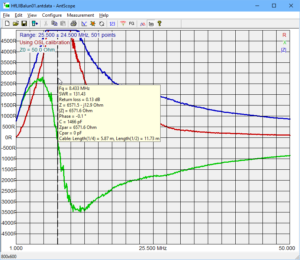 By way of comparison, the Balun Designs 1115i which uses a smaller teflon coax shows Insertion VSWR=1.07 (ReturnLoss=29.4dB) at 31MHz whereas this balun had Insertion VSWR=1.15 (ReturnLoss=23.4dB) at 31MHz. Cost of the whole thing was less than $25, more like half that if it is not enclosed in a box. Building this yourself won’t save you a lot of money, but it will expose you to the opportunity to learn more than buying off-the-shelf. I would not consider any off-the-shelf product that does not publish measured Zcm R,X plots (|Zcm| is less useful), otherwise you are buying on looks alone. More at A low Insertion VSWR high Zcm Guanella 1:1 balun for HF – more detail and A low Insertion VSWR high Zcm Guanella 1:1 balun for HF – more detail #2.